PC to mobile bulk SMS sending program facilitates user to send multilingual messages worldwide from mobile connected to PC via ActiveSync. Text messaging utility can be used for international business marketing services by forwarding instant bulk messages to their business partners. 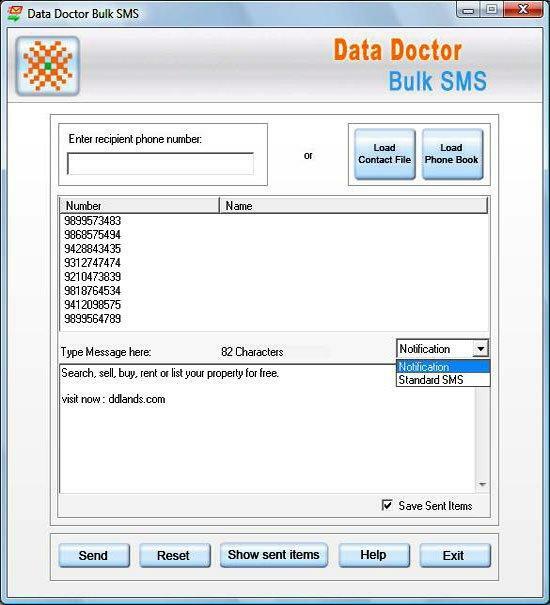 Mass SMS broadcasting utility can compose and send number of bulk text messages to global mobile networks by synchronization process without internet connection. ...... phone via Microsoft ActiveSync and Windows Mobile Device Center) to other mobile. Cell phone bulk sms software allows you to send sms in any language supported by your windows mobile phones. Massive SMS sending software is fastest and cost effective utility which makes it easy for businesses and social organizations to stay in touch with each other through text messages. PC to mobile text messaging utility runs proficiently under all versions of windows operating system including Windows Vista Home Basic, Home Premium, Ultimate. Massive sms sending tool provides inbuilt help manual for all users to easily operate cell phone bulk sms application. Cell phone bulk sms program can compose and send multiple text sms including occasional messages, promotional campaign, personalized SMS, invitation, job alerts, reminders to the family, friends etc to all GSM and CDMA mobile phones. Mobile Text Messaging Software for pocket PC. Does a comprehensive Cell Phone Reverse Search. Using Reverse Cell Phone Lookup you can do a reverse cell phone number research. Qweas is providing links to Cell Phone Bulk SMS Utility 2.0.1.5 as a courtesy, and makes no representations regarding Cell Phone Bulk SMS Utility or any other applications or any information related thereto. Any questions, complaints or claims regarding this application Cell Phone Bulk SMS Utility 2.0.1.5 must be directed to the appropriate software vendor. You may click the publisher link of Cell Phone Bulk SMS Utility on the top of this page to get more details about the vendor.